Figuring out the survival rate of cancer patients relies on a number of tests and it can be difficult for clinicians to determine the prognosis. But a newly developed AI could give them a big leg up. Scientists at Imperial College London and the University of Melbourne developed a piece of machine learning software that can predict the prognosis of ovarian cancer patients — and at a higher accuracy than conventional methods. Their research and the results of an initial trial were published in the journal Nature Communications yesterday. 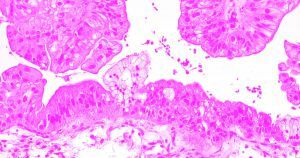 The researchers found that the survival rate of epithelial ovarian cancer was approximately 35-40 percent despite the existence of a number of treatment options. Some 6,000 new cases appear in the UK every year. But developing a treatment that is personalized to the patient is critical — and the earlier the better. The researchers developed a “radiomic prognostic vector” (RPV) — a piece of software that looks at four biological characteristics of tumors including structure, shape, size, and genetic makeup in CT scans — that turned out to be four times as accurate at predicting outcomes when compared to conventional methods in an initial trial that examined samples from 364 women. The RPV also “reliably identifies” the five percent of patients that normally only have two years to live. By identifying them early on, they could improve prognosis and optimize treatment plans for those patients.